CAFKA first encountered Samuel Roy-Bois through his work "Égarement" in 2010 at the Manif d’Art in Quebec City. There he created a stunning piece, using an audio tour to convert a simple a row house into an enchanted space. The audio tour ended in a bedroom, and surprisingly, with a performer asleep in it. It became evident that the audio tour was in fact the thoughts of the sleeper, as the narrative slipped gradually into the confusing and conflicted space of dreams. For CAFKA.14, Samuel Roy-Bois again returned to the dream as his source of inspiration for the work “The Brittle Edges of Coherence.” The artist's dream of a car passing through a modernist building became the inspiration for an artwork that was at once a public space, event and narrative. His original sketch envisioned a scaled high-rise tower about 6 metres high with Plexiglas windows and 2 x 4s mimicking floors. A lighting system would illuminate each floor and a wrecked car would be merged into the tower. 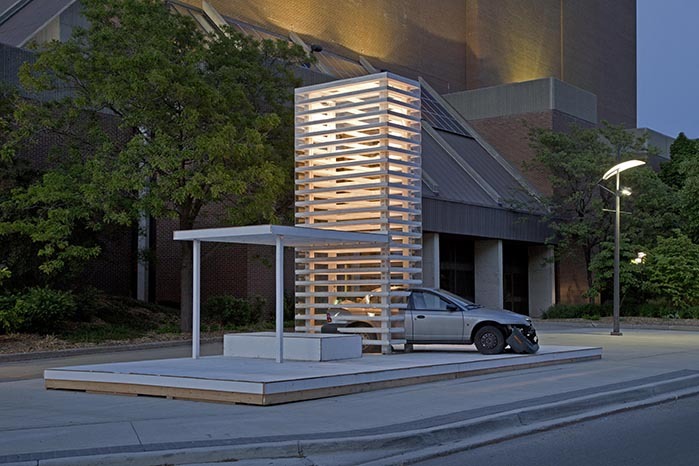 A platform with a canopy and bench made out of plywood would provide a place where people could hang out. When Samuel Roy-Bois initially proposed this work to CAFKA, he imagined that independent contractors would undertake the construction and it came with a hefty price tag, far beyond CAFKA’s means. But as an artist-run organization, CAFKA has a history of DIY. We decided we would build it ourselves. Founding CAFKA board member Rex Lingwood led the construction team of fourteen volunteers, CAFKA staff, and Samuel himself. Over the course of the build the number of volunteers working at one time varied from two to six. Nearly half the volunteers had worked on CAFKA projects in past years, bringing not only building experience but also familiarity with building art projects that deviate from standard construction. New recruits also brought valuable experience and quickly integrated into a shifting and improvised work structure. There was preliminary work to be done before the arrival of the artist: Cutting and pre-drilling the acrylic sheeting for the exterior, painting all structural material and plywood that would be visible, and then building the platform that formed the base of the sculpture. This began about two and a half weeks before the opening and was all completed before Samuel's arrivel in Kitchener. CAFKA Artistic Director Karie Liao made arrangements for a suitable car at Kitchener Auto Wreckers, and we met there on the morning of Monday, May 26, 2015. A Saturn, whose body was still in pretty good shape had been selected for us, which was puzzling. Where was the wrecked car? It soon became evident that the people at Kitchener Auto Wreckers had decided to personally customize the car. A collision was staged in the junkyard to create the correct amount of front end damage to the car as specified in Samuel's sketch. Samuel Roy Bois reflected on the project while waiting for the car at Kitchener Auto Wreckers. Kitchener Auto Wreckers delivered the car to the work site and it was placed in position. A hole was cut in its roof and floor to accommodate one of the four 6 x 6 inch posts that formed the core of the structure. Raising the three posts that rested on the deck was relatively simple but raising and lifting the final post so it could be dropped through the holes in the roof and floor of the car was more challenging. As we could not afford a crane, a certain amount of “Egyptian engineering,” as it came to be known, was required. It became clear quite early in the final week that it was going to be difficult to complete the project on time exactly as had proposed. There were major difficulties with putting a floor in every level of the scale model building, and to have four lights on every floor. Putting in the floor was going to be very time consuming and the lighting, and as proposed, required inspections. There was also a problem in finding the power needed for the lights within our budget. After considering a number of solutions to reduce our power requirements and still not being able to talk to an electrical inspector who would have to sign off on the project, Samuel decided to eliminate the floors, and illuminate the structure with two construction lights mounted inside the top of the structure. Since everything we used was off the shelf, both lights and extension cords, no approvals were necessary. These were good decisions but not easy ones as there were compelling conceptual reasons for retaining the original design. As it turned out, and as Samuel readily acknowledged, these decisions both improved the piece and meant we finished it in time for the opening with at least an hour to spare. Rex Lingwood reflected on the effect of the work. "'The Brittle Edges of Coherence" had an extraordinary dream like quality, which was heightened when lit at night. This was perhaps the result of the contrasting scales involved in the piece, the car at its normal scale the building a scale model and the portico whose scale was ambiguous. It was compellingly beautiful, perhaps more so than the artist intended and despite the wrecked and vandalized car and construction details designed to suggest a more improvised and less pristine structure. Over the course of the month it was in place, this emphasis on impermanence became more pronounced as water stained some of the painted surfaces. If it could have been in place longer this aspect of the piece would have been more pronounced." "The installation was particularly well sited as it made reference to the apartment blocks across Queen Street, both with respect to the architecture, the on-going renovation of the exteriors and the cars that are housed beneath them. The dramatic theatrical quality of the work was also entirely appropriate to its location in front of Centre in the Square giving their audiences a performance of a different sort both before and after their evening in the theatre." Formally, Samuel Roy-Bois has once again has taken the elusive and ephemeral imagery of the dream (or nightmare) and given it an unlikely sculptural form. He specified that the car be physically "merged into (the) tower . . ." and that "the Plexiglas would will be cut around the car as accurately as possible. . . . (The) side of building with (the) car will need a skilled carpenter with finishing skills." At the same time Samuel stated that "It should look crafty, DIY, and hand made . . . accidents and visible handwork are okay." Which is to say perhaps, that we will attempt to represent a car passing through a building, but that it will remain an essentially flawed fabrication, as all representations are. "The Brittle Edges of Coherence" is a sculpture that is intended to evoke a transient dream using construction grade lumber and a wrecked car. It is simultaneously an event, a fading memory, and a public intervention." Samuel Roy-Bois spoke about "The Brittle Edges of Coherence" through an interpreter on Nov 27, 2014 at Emily Carr University. Segment begins at 49:44 min. in the video below. Video courtesy of Emily Carr University. CAFKA Artistic Director Karie Liao over-saw much of the development of the piece. She reflected on the work by citing its ghost-like quality: “It might be obvious, but for me the high-rise and car are both symbols of modernity. The collision, a nod to the failure of modernism, acts as a harbinger of the dystopic future (maybe present reflection) of global cities (e.g. China's impoverished rural communities and empty condo developments).” And she makes reference to Walter Benjamin, who about Paul Klee wrote: "There is a painting by Klee called Angelus Novus. It shows an angel who seems about to move away from something he stares at. His eyes are wide, his mouth is open, his wings are spread. This is how the angel of history must look. His face is turned toward the past. Where a chain of events appears before us, he sees one single catastrophe, which keeps piling wreckage upon wreckage and hurls it at his feet. The angel would like to stay, awaken the dead, and make whole what has been smashed. But a storm is blowing from Paradise and has got caught in his wings; it is so strong that the angel can no longer close them. This storm drives him irresistibly into the future to which his back is turned, while the pile of debris before him grows skyward. What we call progress is this storm." Originally from Quebec City, Samuel Roy-Bois is currently residing in Vancouver. He acquired his BFA from Université Laval in Quebec (1996) and a Masters Degree in Fine Arts from Concordia University in Montréal (2001). His installations have been shown across Canada and internationally; his solo exhibitions include La pyramide, Galerie L'oeil de poisson, Quebec City (2015); Not a New World, Just an Old trick, Oakville Galleries, Oakville (2015); Carleton University Art Gallery, Ottawa (2014); and Simon Fraser University Gallery, Burnaby, BC (2013); J’ai moonwalké, sans cesse, jusqu'à l'épuisement, Parisian Laundry, Montreal (2013); I had a great trip despite a brutal feeling of cognitive dissonance, Artspeak, Vancouver (2012); Polarizer, Southern Alberta Art Gallery (2009); Let us, then, be up an doing..., Contemporary Art Gallery, Vancouver (2008); Divertissements, Point éphémère, Paris (2007); Improbable and ridiculous, Musée d’art contemporain de Montréal (2006); J'ai entendu un bruit, je me suis sauvé, Or Gallery, Vancouver (2003).